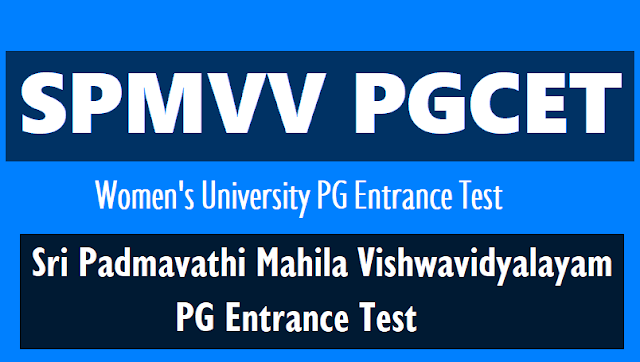 SPMVV PGCET 2019, Sri Padmavathi Mahila Vishwavidyalayam PG Entrance Test 2019, Online Application Form, Fee Details, Eligibility Criteria, How to Apply, Last Date, Entrance Exam Date, Hall Tickets, Results, PG Admissions 2019 Counselling Dates: Sri Padmavathi Women's University PGCET 2019: Sri Padmavathi Mahila Vishwavidyalayam, A state Government Women's University, Tirupati has issued Post Graduate Common Entrance Test Notification (SPMVV PGCET) 2019 on March, 2019. SPMVV Officials invite applications from all the eligible women candidates who have passed /appearing for the final year examination in the qualifying degree for admission into Post Graduate courses offered by Sri Padmavati Mahila Visvavidyalayam, (Women’s University), Tirupati through SPMVVPGCET 2019. The courses offered are of two years duration (4 semesters). The regular (R) and Self Financing (SF) courses offered in the University. All students of Andhra Pradesh and State of Telangana are local students to SPMVV. SPMVV is a state wide University and admits students from all regions of Andhra Pradesh in the ratio of 42:36:22 for Andhra, Telangana and Rayalaseema regions respectively. 1.The candidate should have passed the qualifying examination with a minimum of 40% marks in the concerned subject. For the courses where the admission is based on the degree as a whole, the aggregate percentage in the group subjects should be 40% of marks. For admission into M.Ed., the aggregate marks in B.Ed. should be 50% and the aggregate marks in degree/PG should be 45%. Qualifying the corresponding Bachelor’s degree exam is sufficient for SC/ST candidates for admission in to any course. 2.Candidates who have already passed the qualifying examinations or who have appeared / are appearing for the final year annual examination in 2019 are eligible to apply. Supplementary candidates of 2019 are not eligible. 3.Eligibility criteria fixed for each course is given in Section R.
Even if you selected the Test Center no need to write the Entrance Test for Integrated, B.Vocational, P.G.Diploma, Certificate Courses. 1. Candidate has to submit a separate application for each test. 3. Application can be obtained by post from the Director, Directorate of Admissions, Sri Padmavati Mahila Visvavidyalayam, Tirupati-517 502 by sending a demand draft (DD) for Rs.465/- (including postage for sending the application) drawn on a nationalized bank in favour of The Director, Directorate of Admissions, Sri Padmavati Mahila Visvavidyalayam, Tirupati payable at Tirupati with the name and address of the applicant clearly written on the reverse side of the DD. The last date for submission of Applications for P.G Courses and B. Ed (Spl) (H.I) for SPMVVPGCET- 2019 is extended from 0..-05-2019 to ...-05-2019 and 5 year integrated, B. Vocational, P. G. Diploma courses, though direct admissions is extended till ....-06-2019. However it is to be noted that date of entrance test will remain same as on ....-05-2019 as per the information provided by Prof. V.Kalarani, Director, Directorate of Admissions. The Candidates can download their hall tickets from 17-05- 2019 through website: www.spmvvdoa.in.